Electronic perfectionist and passionate advocate of improvised music, Shaun Blezard makes beguiling noises both alone and as part of various collaborations, including Ripsaw Catfish (Cath Roberts and Anton Hunter), Hugs Bison (with Phil Powell), and Some Some Unicorn (with too many people to list here). He’s also the brains behind label ODD7 Recordings, and weekly radio show Towards the Margins. My first instrument was a bass guitar in 1986. In traditional band folklore, I had a van so was asked to get and play bass in a new band, The Peach Thieves. Eight weeks later I played my first gig. I wasn’t very good, but the spirit of punk, post-punk and C86 DIY ethics pulled me through. After 30 years I can now play but still hold dear the DIY ethic from back then. What did it mean to me? A way into the magic world of gigs, playing music with others, a means of expression. It was an Italian Rickenbacker copy – semi-acoustic, based on the Ricky 330. Looked great, short scale and played nice but didn’t sound that good. The first record I bought, other than children’s records, was the Ian Dury 7” Hit Me With Your Rhythm Stick in 1979. I became obsessed with music from then on, spending pocket money and dinner money on records from Discos the record shop in Ulverston, Cumbria, run by two old ladies. They didn’t have that much exciting stock in outside the charts but once I started reading Sounds, NME and Melody Maker – the three music weeklies – I regularly ordered stuff from them; lots of second wave punk like Stiff Little Fingers and pop stuff like Altered Images. Most recent? I’ve been having a bit of a spree lately so quite a bit has been coming through the door. The two things that have really caught my ear are the Kronos Quartet play Terry Riley box set and We Insist by Max Roach. Both I wasn’t that familiar with, I don’t really come from an avant-garde background, so there is such a deep vein of amazing music to listen to. I came to much of this from ambient dance – Steve Reich via The Orb, Jah Wobble’s Deep Space and then seeing Keith Rowe, quickly followed by Evan Parker, live. This made a very deep impact on me and I wanted to know more and to play this music. That depends on the project. My current set up for free improv is an iPad, mainly running Samplr, and a volume pedal – I use the built in mic to take recordings of the other players and bring that back into the performance. I also use lots of apps I can pull in – singing bowls, kalimba, a great app called Thumbjam that has some amazing sounds of traditional instruments. For solo work I preload some samples onto the iPad and use lots of delay and reverb to create rhythms and textures. I’m using really tiny fragments of sound more and more and getting further away from the loops format that I started with doing danc-y stuff. I find loops become really dull very quickly – my least favourite concert experience has to be watching a band build loops up to sing over…. So dull…. I work with long delays now so you get the feel of loops but they slowly and organically change so the music has much more momentum to my ears. For the current Hugs Bison set up I am doing live visuals more, with Phil taking more control of the music. This is the most preparation I do. We have been doing site-specific performances that involve collecting sounds and film from a location and then editing those down into raw material for the show. This has been working out at 1-2 days of field recording and editing to play a 45-minute set. We have just done a tour of seaside towns, funded by Sound and Music where each gig was built like this. Hard work but I really liked the time seeing the town we were in, meeting up with people, slowing down a little. The amount of time spent in front of a laptop is quite long though. That’s a very hard question to answer. I’m not a field recordist in that other than some background beds I use field recording as raw material. I look for the musicality in small sections, in the past to build a collection of loops in Ableton Live to improvise with. Now I’m tending to put longer samples together and playing them in Samplr – playing small sections into delay and building upon that – similar to what Philip Jeck does with vinyl. One of the most interesting projects that I did was Soundonation, where I built a live set and made an album only using sounds that were donated to me. This included some amazing cello playing, bits of lovely field recording and things like cats purring. This idea of collective music making also led to the Some Some Unicorn album – 30+ musicians improvising to solo iPad recordings that I edited together into an album. 5. What prompted you to set up ODD7 Recordings? 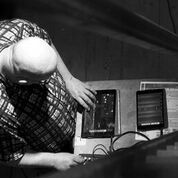 Being based in Cumbria in the North West of the UK, I am quite far from the improv scene so don’t get to play as much as I would like; so it was a way to connect with people and hear good music. There is the argument of improv being best in a live setting, but my way into the music has been as much recorded as live. So I thought it would be good to put some small editions of CDs out from musicians I really love. The first was by Yoko Miura and Teppo Hauta-aho, which is now sold out on CD. The next edition is nearly ready and features Greta Buitkutė & Charlie Collins. We are in interesting times. I have Spotify premium, which I use quite a bit, especially the offline function. I can load a few albums onto my phone and play them in the car. Also great for using like a radio, dig about looking for interesting stuff. The pay scheme isn’t great and needs looking at but I really like the concept. I used to file share but have since preferred Spotify and buying music when I can. I buy quite a bit directly from artists & labels on such platforms as Bandcamp. I think musicians should get paid for their music but we need to build a culture that values art much more than it does. I think the file-sharing craze was a reaction to the corporate greed of record companies to some extent. At one point CDs were about £15 and they might not be that good, so the chance to download and listen would look like a good idea. Also the sharing of bootleg recordings and out of print stuff was interesting. Great if you were reading a biography. I guess I use the tools that interest me and let the argument rage. It will die down and a new model will emerge and I will work out a way to move and be an artist within that. A tour and recording session for Some Some Unicorn – a big band of my favourite players working with me to produce the sound I have in my head, and for everyone to be paid! Money will always be a problem in experimental music, you will end up doing projects for the love of it – I can do this as my freelancing life of commissions, workshops and commercial work pays me for some time to do what I want, with a little funding here and there it works out mainly, if I work cheaply and with others that can share their time and talent. I use skill swapping more and more out of necessity – you play that for me, I’ll do you some promo photos kind of deal.